Here at Balliol, we have a strong emphasis on Values Education. Each month the children are taught about a new value such as Understanding, Responsibility etc. This is designed to promote a caring and safe environment for all children to learn, have fun and achieve. Children can earn house points which are added up weekly. The team with the highest score wins the house trophy in our weekly celebration assembly. The winning team get to put their teams coloured ribbons onto the trophy and this is then displayed in the corridor for the week. We also hold a sports day in which the children represent their house teams. We are proud of our houses as this enables children to quickly become part of the school community, and develop a sense of teamwork and feel a sense of belonging. In Foundation Stage, Year 1 and Year 2, the children can earn rewards such as a sticker on their rainbow, a head teachers award, fantastic news or house points. These are awarded in a special Friday celebration assembly each week. One child from each class is also awarded star of the week. How many colours have you collected? Each colour on the rainbow represents a different positive behaviour based on the KS1 values. The children collect segments of their rainbow throughout the year. Once they have collected all 7 colours, they are given a 'Rainbow Reward' in a celebration assembly. 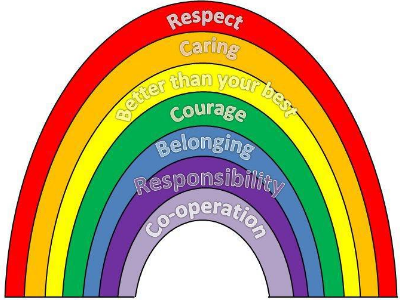 How can I demonstrate these rainbow values in school? Respect: opening doors for people, using polite manners, helping everyone, looking after you own things, keeping the school tidy, being ready to learn, listening. Caring: smiling at people, being friends with everyone, looking after people that are hurt or upset, playing with people, being helpful, listening, holding doors open. Better than your best: challenging yourself, improving your work, always trying your best, making your work really neat, never giving up, having a go at everything, learning from mistakes. Courage: being brave in assembly performances and swimming, trying new things, challenging yourself, helping others when you can see that they are nervous, worried or upset, being friendly and brave and helping children that are new to the school, showing visitors around the school. Responsibility: behaving nicely and following the rules, treating equipment with care, listening to others, sharing, being kind and caring, being helpful, remembering to bring a book bag, water bottle and PE kit to school, being polite and using kind manners. Co-operation: working as a team, working well with a learning partner, listening to everyone, helping people to explain their ideas, listening to other peoples ideas. If you can think of more ways, please let your class teachers know so that we can add it to our list. Year 3 and 4 use Class Dojos that are linked to the Key Stage two values (Empathy, Enthusiasm, Self-Control, Curiosity, Appreciation, Perseverance, Optimism). Each class leader is celebrated in the Key Stage 2 Friday assembly and certificates are given out for milestones (Bronze = 50 Dojos, Silver = 100, others TBC). Year 5 and 6 use ePraise as their reward system which is also linked to the Key Stage two values. Overall leader and class leaders are celebrated in a Friday assembly. EPraise points build up and can be use in the 'shop' to buy rewards. The top prize is a trip to MK theatre or a London museum! They can also achieve accolades for things like attending clubs etc.